To make an instant comparison to previous E4 hit The Inbetweeners would probably be lazy, yet you can’t help but get that feeling from Drifters. On the surface you have the familiar friendships, sexual content and the occasional disgusting moment, yet Drifters is more than a female version of Damon Beesley and Iain Morris’s teen sitcom. Granted, when you delve deeper into Drifters you see that it’s actually executive produced by Morris, and stars three girls from The Inbetweeners Movie, so the connection continues. Written by Jessica Knappett, Drifters follows three best friends in Leeds who struggle with their lives after graduating from university. Knappett is far more than just an Inbetweeners girl, having performed with a sketch group at the Edinburgh Fringe Festival and numerous gigs around the country. Jessica’s co-stars Lydia Rose Bewley (yes, sister of Charlie of Twilight fame) and Lauren O’Rourke are joined by familiar faces Bob Mortimer and Arabella Weir, as well as Nick Mohammed. As with any successful comedy, Drifters pulls from real life experiences and tells a hilarious tale of three girls desperate to succeed in all areas of life. This is a show that many people will relate to, whether unlucky in love or finding it hard to get a decent job. Of course the situations are amplified for maximum laughs, but Drifters stays grounded in reality most of the time. Meg (Knappett), Bunny (Bewley) and Laura (O’Rourke) all bring a modern twist to the familiar situation of a group of friends failing at life. Wanting everything they desire yet aiming to do as little as possible to get it. Meg and Bunny were more interested in travelling around India than getting a job straight out of uni, and they now return back to a harsh reality in Leeds – including Meg’s ex Mark who seems to think they’re still together..
With inspiration from Tina Fey and Amy Poehler, it’s clear that Knappett has a hilarious knack for comedy and a great recipe for success here with Drifters. Not only do the cast have a strong chemistry together but the writing is solid, and clearly there are lessons learned here from The Inbetweeners in terms of what makes a show so likeable. Whether Drifters hits those highs remains to be seen, but it clearly has potential and should be one to watch over the next few weeks. 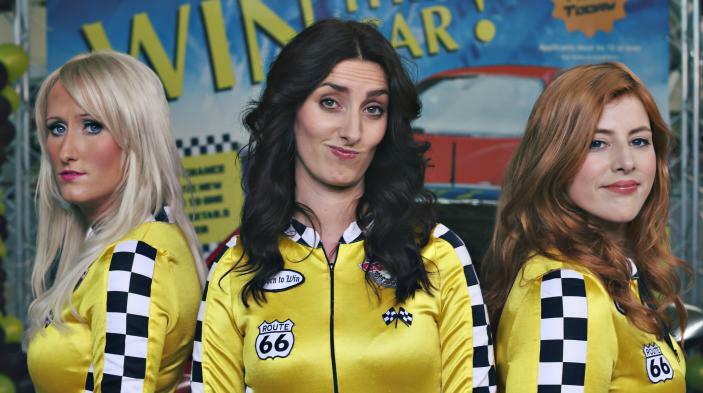 Drifters starts on E4 tonight (31st October) at 9pm with two episodes. One comment for "E4 Drifters Preview"
Seriously?? Watched the first episode-will not be watching any more. Primarily, It’s not well-written and crucially,for a comedy, it’s just not funny. The ‘comedic’ scenarios & exchanges persistently fell short of the mark & they were just dull. It’s not a sharp edged comedy if the script isn’t well enough executed to allow the humour to cut through the uncomfortable,near the knuckle situations. The paedophiliac teacher storyline was creepy,humourless and,given recent headlines,poorly judged,offensive & in plain bad taste. We must be in desperate need if this is the best that current writers have to offer!